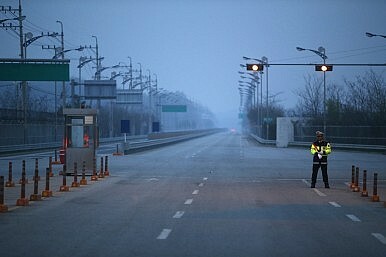 Between UN sanctions and Pyongyang’s survival instincts, Seoul has fewer carrots to offer Pyongyang. From the Sunshine Policy to the $3000 per capita GDP proposal, Seoul once had no limits on assisting North Korea. Today, Park Geun-hye is the first president facing an aid restriction. It comes in the form of UN Resolution 2094 of March 2013, which bans “bulk” cash transfers to North Korea, in the hope of impeding its nuclear weapons development. (This sanction is less restrictive than the May 24, 2010 measures, but being international is more binding). As Seoul is the primary beneficiary of the sanction, it has reason to actively implement it. However, the Park regime – which entered office about the same time as the resolution – has been passive when it comes to determine the practical levels of allowable cash transfers, and slow to search for aid ideas that meet those levels. It has also been laggardly in educating the public as well as Pyongyang on the need to uphold the mandate. Consequently, North Korea expects the same sort of high cash-content aid projects as before, while Southern businesses with vested interests urge the government to oblige. The government’s responses have been passive, saying there must be “an assurance that any reopening of the tour would not violate the international sanctions.” Assurance from whom? The administration should rather have put out a policy, and persuaded the public as well as Pyongyang of its justification under the reality of Northern nuclearization and the accompanying Resolution 2094. Instead, tourism has been left dangling and keeping hopes alive for both. One approach might be for Seoul to consult with allies on starting tourism on a small scale of several million dollars worth a year, in place of the $40 million industry prior to the suspension, and use it as an incentive for Pyongyang to accept another aid offer. Before this passivity did its damage, Park was doing well with her Trustpolitik, which entailed slowly building trust with Pyongyang for inter-Korea cooperation. The policy gained strong domestic support and even Pyongyang’s indulgence. Understanding that trust takes time to build, South Koreans supported Park’s firm responses to the bellicose actions of the North during the first year of her presidency. All this came crashing down on March 28, 2014 when Park delivered a speech on her North Korea policy in Dresden, Germany. In the speech, dubbed the Dresden declaration, Pyongyang may well have looked for an opening, partly because it had made a concession of sorts in the agreement a month earlier allowing a round of family reunions, whereas Seoul gave up nothing. The declaration was a letdown for Pyongyang, however, as it made no reference to the Mt. Kumgang tourism. Though there were several aid offers in the address, Pyongyang became so upset that it denounced the offers as the “daydream of a psychopath,” and followed with personal attacks in increasingly sexist terms, which have continued. If the anger was prompted by a continuing suspension of tourism, what aid possibilities might exist to end it ? Among the proposals laid out at Dresden is an idea to assist mothers and infants from pregnancy through their first 1000 days. It aims to expand and upgrade the activities conducted by UN agencies since the North Korean famine of the mid 1990s. As the program consists primarily of providing small packages of nutrients for mothers and children – the kind of stuff that would be difficult for Pyongyang to turn into cash, it would comply with the sanction. Existing UN programs are shrinking due to declining donations, so the North should find this proposal attractive amid relentless food shortages. However, Pyongyang is liable to loathe it given that it reaches hundreds of thousands of households with inerasable warmth. Still, South Korea should at least try to get its neighbor to accept the mother-child program, which warrants the effort. Another Dresden proposal is major investment in infrastructure “such as in transportation and telecommunication.” This latter area is highly sensitive and a nonstarter. Moreover, the idea of helping with transport renovation overlooks the sanction as well as the North’s repeated rejections of past offers from the South. Starting with Kim Dae-jung, every president has proposed to fix North Korea’s railways for mutual benefits and the potential for lasting and deepening ties. Pyongyang has remained resolutely opposed. The resolve was demonstrated by the unique inter-Korea train crossings of May 17, 2007. The two Koreas had agreed to reconnect their rail systems in 2000 and finished the work in 2003 for a reported cost to the South of $598 million. Then the North refused to use the connected railroads for four yeas. Finally, in 2007, it agreed to allow trains to run on the cross-border tracks, but only for one exhibition, and for a reported total price of 400,000 tons of rice and $80 million worth of industrial materials. Since the 2007 event, the connected railways have been rusting, despite the estimated hundreds of million dollars a year of transit fees that would accrue to Pyongyang if the rest of North Korea’s railroads are repaired and used. Pyongyang sees regime survival as incompatible with South Korean trains loaded with tourists and export merchandise speeding through the lengths of its denuded, isolated land. Indeed, Seoul’s options for economic aid have long been restricted by Pyongyang’s survival instinct. This restriction long preceded Resolution 2094, which in fact only removed the mid-size projects – the major projects had already been blocked by North Korea. What remains for Seoul are small projects. Ironically, these are difficult to find because they depend on detailed knowledge of the North’s economic sectors. This leads to the last significant Dresden proposal, the agricultural technology transfers that involve “setting up multi-farming complexes supporting agriculture, livestock and forestry.” The complexes would conduct joint research. But the proposal was wrapped in offensive language for the North, lauding the expected close contact among researchers as follows: “Working together from sowing to harvest will enable South and North Korea not just to share the fruits of our labor but also our hearts. As bonds of trust begin to bourgeon between the two sides ….” Bourgeoning bonds are what Pyongyang fears, and such proposals would hardly be welcome. Still, the troubled agricultural sector gives rise to a range of aid possibilities that will not fall foul of the sanction and are potentially attractive to Pyongyang. One example is farm equipment. According to the Food and Agricultural Organization, the Chollima (Flying Horse) tractors are still the primary power source for most farm co-operatives. Production of these tractors began in 1958 and ended in the mid-1980s after a reported cumulative total of 75,000 units. By 2012, the total stock of tractors had fallen to 60,472, including several hundred large tractors donated by European countries. This decline reflects cannibalizing maintenance and junked tractors. The Flying Horse tractor has an 18-horsepower diesel engine – slow and weak. The shrinking number of operating tractors provides an opening for Seoul. An offer could be made to manufacture and hand over Chollima spare parts. Another idea would be for Seoul to produce and deliver walk-behind, two-wheel tractors capable of running on impure diesel. As much as 40 percent of the farmland outside the rice-growing plains is reported to be tilled by oxen. The two-wheel tractors would be able to replace the beasts. The tractors must be tolerant to impure diesel because the fuel reaches the farms with contaminants picked up en-route from the national to provincial and through the county bulk containers, and finally to the drums sent to the farms. The contaminants are tolerated by the slow but rugged Chollimas, but are quite damaging to the powerful tractors donated from abroad. Perhaps Southern industrialists can produce impure-fuel tolerant tractors. The spare parts and new tractors would increase food production to an extent, but much of the increase would directly benefit the least privileged North Koreans living in the hinterland, because they would get most of the tractors and Chollima parts. This all brings up a basic point: Infrastructure reconstruction and mid-size projects are out and small programs remain. Yet Pyongyang is accustomed to larger cash-rich projects and is uninterested in smallish programs promising little cash flow. Therefore, as long as the North sticks to its weapons of mass destruction, i.e., in the era of Resolution 2094, the Park administration must think small and persuade Pyongyang of the need to accept modest programs, if cooperation is to grow for the first time in more than a decade. Hy-sang Lee, retired professor of economics, University of Wisconsin-Oshkosh, and author of North Korea: A Strange Socialist Fortress, 2001. North Korea: To Talk or To Provoke? Trustpolitik may be a start, but all parties need to return to the table at some point.